V-CUBE receives “Web Conference Japan market share leadership award” for 5th consecutive year from Frost and Sullivan | V-cube, Inc.
V-cube Inc., (headquarter: Tokyo Meguro-ku, President & CEO: Mashita Naoaki) develops and offers Webinar, Web conference and other visual communications services that are available “anytime, anywhere, anybody” to enterprise customers. 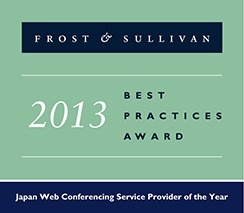 For the 5th year in a row, V-CUBE is granted “the 2013 Frost & Sullivan Japan Market Share Leadership Award in Web Conferencing” since 2009. Frost & Sullivan is a consulting firm that helps companies of global scale to expand and grow through global market research as “grow partnership company”. In the past 50 years, Frost & Sullivan has helped 1000 companies with their growth strategy, new business model, and market investment. “The Market Leadership Award” is granted to the company that excels in market strategy and holds the No.1 market share. In terms of market isolation, program and management, market trend analysis, V-CUBE excels in all of the above requirements for market leadership award. In addition, V-CUBE has proven that its products are suitable for any changing market through strategic marketing. Striving for success through various marketing strategies had allowed V-CUBE to excel in its industry and gain the status of market leader. In order to select the right company for this award, analysts tracks the revenue and market share of the candidate companies. This is done through a private resource twice and a series of internet research. Also, by conducting very strict research among the candidates, Frost & Sullivan provides the award to the winner after referring to rankings throughout industries. There is a standard method to narrow down the winner between candidate companies through ranking. The details are as below. Multiple measurements are taken to ensure the results are fair and correct.